As I sit here writing this post, my view from the window is of a big North Sea, swell battering the rocks and juvenile Shags struggling to stand up. Luckily its fairly warm inside, although the window isn't completely wind-proof, from a gusting force 7 anyway. It certainly does not feel like August. These constant westerlies mean quiet days for us, both in bird and human terms, as the islands have been closed today. A single Sand Martin and a Kestrel provided the excitement. However, Roseate Tern numbers are building nicely, up to about 60 now, and they are incredibly showy. These very rare UK breeders nest just down the coast on Coquet Island where they had an excellent year, and we are reaping the rewards. The recent high tides mean that the waders lingering on the islands get pushed up nice and close and make them a lot easier to count. Average numbers from Inner Farne this week have included 200 Turnstone, 20 Dunlin, 10 Purple Sandpipers, a few Redshank and a few Knot, including some lovely adult birds. Nothing as rare as the lovely Stilt Sandpiper that has been at Cresswell Pond recently however, and my photo below really doesn't do it any justice. Redshank, Turnstone, Dunlin (not playing ball) and a lovely adult Knot. There have been a few nice moths and butterflies around as well. A few vagrant Wall Browns have been on the island, as well as a Painted Lady. 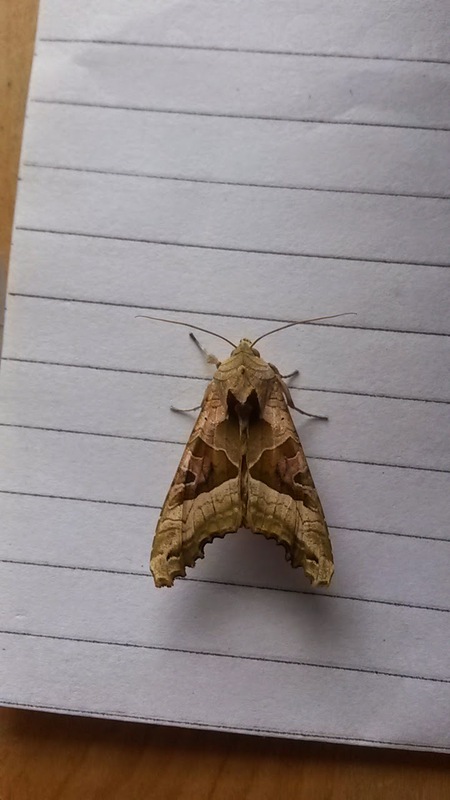 Moth highlights have included Willow Beauty and this lovely Angle Shades that was sheltering in the Pele Tower this morning.